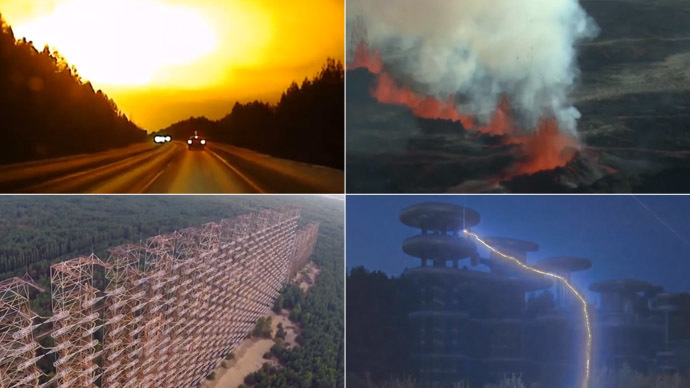 From lightning bolts to volcano vaults, rocket implosions to missile explosions - Mother Nature had it all during 2014, all caught through camera lenses across the globe. A driver near the Ukrainian city of Donetsk was just a couple of seconds from certain death after a missile exploded just meters in front of his car. He emerged unscathed and posted the video on the main Russian social network Vkontakte (In Contact), entitling it “My second birthday.” He may need a new car though as the front was smashed by debris from the road after the missile struck. An Antares rocket exploded seconds after launch on the Virginia coast on October 28. The US spacecraft was heading to the International Space Station (ISS) on a supply mission. No one was killed during the unmanned launch, but NASA warned that the explosion may have resulted in debris scattering across surrounding areas, which may wash up on shore. Stunning video footage was released a month later, giving some spectacular close-up shots of the explosion. Different angles captured the moment the $200 million rocket went up in flames. It was a cold dark evening on a road in the Ural Mountains region of Russia. Nothing unusual there - until a brilliant collage of orange, yellow and red momentarily lit up the dark landscape. But what caused it? This question still puzzles Russian scientists after the moment was caught on a dashcam. A new meteorite or military exercise were some of the top guesses from the bewildered public. However, both were dismissed by officials. So could it have been a UFO? The truth is out there. An American photographer used a drone to capture amazing images of the area surrounding the Chernobyl nuclear power plant. He gave a new perspective of the desolation the accident caused. Phillip Grossman was given access to the control room at reactor number four, where the disaster on April 26, 1986 began. The room is still highly radioactive, while Grossman described this area as one of his most poignant memories of his trip. A rare double tornado tore through the American Mid-West state of Nebraska in June, leaving a trail of destruction in its wake. The US national weather service confirmed the presence of the twin twisters, which were about 1 mile apart. One five-year boy was killed, while 19 people required hospital treatment. Streams of lava spewing out from the Bardarbunga volcano over the summer were reminiscent of Mount Doom in ‘The Lord of the Rings’. In September, a tour company was offering flights over the crater at a height of just 150 meters for just shy of US$1,000. The eruption is considered one of the largest in Iceland's history. By October 1, Bardarbunga had already ejected more sulfur dioxide than any other volcano there in several hundred years. It was much greater than Eyjafjallajokull’s headline-grabbing eruption in 2010 - which was surprisingly paltry in comparison – because of how it grounded flights across southern Europe. Astronomers and stargazers were given a special treat on October 8, as the moon was lit up in a blood red color. An optical trick played by the Earth's atmosphere offered a rare chance to see both an eclipsed moon and a rising sun at the same time. The optical phenomenon was best seen from Asia, Australia, North America and Russia’s Pacific region. The first ‘bloody’ eclipse out of a sequence of four red moons called a tetrad set for 2014-15 happened on April 15. The third and fourth will take place on April 4, 2015 and September 28, 2015. A powerful thunderstorm swept through New York in early July, creating some breathtaking images for amateur photographers. It was a prelude to Hurricane Arthur and dumped plenty of rain on the Big Apple. Massive lightning bolts rent the skies above Manhattan, with one striking the top of One World Trade Center. The torrential rain led to a section of an underpass of the Brooklyn Bridge collapsing, leaving five people injured, while other parts of the city suffered flooding. The 6-Megavolt generator, one of the most powerful in the world, is capable of generating 200-meter-long lightning bolts and was put back into action especially for RT. Having been constructed in the 1970s to test the effects of lightning on aircraft, it had been largely out of action since the collapse of the Soviet Union. It has become an eager destination for tourists who want to have a closer look at the mysterious coils. Meanwhile the scientists who operate the tower are hopeful that the facility, which unleashes as much energy as 25,000 plugged-in sockets working all at once (albeit only for a fraction of a second), will start to attract more business in the future. Two Americans are among the first explorers to have stepped inside one of the world’s most dangerous and inaccessible volcanoes. They described the volcano in Vanuatu in the South Pacific as being like a “window into hell.” In fact, more people have visited the moon than the lava-filled crater on the tiny island. The duo had to wear protective suits because of the extreme heat and to stop acid rain from burning them. George Kourounis said that the Marum volcano was one of the most intense experiences he has ever had and that it was "kind of like a reverse climbing of Everest."